How many times have you heard that a man named Abner Doubleday invented baseball? For most of my life I thought he did. When my Mom and Dad took us to the Baseball Hall Of Fame back in 1974, we even visited Doubleday Field. This man is legendary among baseball fans. He's the father of our game. Of course Abner Doubleday invented baseball, or did he? Major General Abner Doubleday was given credit for inventing baseball in 1905. The Mills commission, lead by A.G. Spalding decided to look into the origins of baseball. They concluded that Abner Doubleday had written the rules for baseball in 1839, in Cooperstown, New York. The problem was that Spalding's committee was more interested in public relations and publicity than they were with the facts. A man named Alexander Cartwright actually wrote many baseball rules in 1845. But even by that time, baseball had been played for years. So how did this guy Doubleday get the credit? A man named Abner Graves wrote a letter to Spalding's commission claiming to be a childhood friend of Abner Doubleday. Graves explained in the letter that he was present in 1839 when Doubleday explained his game of baseball to some kids playing marbles on the street in Cooperstown. Graves said that Doubleday even drew a baseball diamond in the dirt to explain his game to the kids. Well, that's all Spalding and the commission needed to hear. They were looking for someone to credit with the invention of baseball and they had found him. One problem that the commission decided to ignore was that in 1839, Abner Graves was five years old and Abner Doubleday was attending the West Point Academy. Doubleday was credited with a few rules of baseball, including limiting the number of players. This was actually written down in 1845 by Alexander Cartwright. But then again, the truth didn't seem to matter. The commission had found it's hero and the town of Cooperstown ran with it. The town decided to build a ballpark on the spot were Abner Doubleday supposedly had shown the boys his game. Construction started in 1920. Doubleday Field still stands today and is the site of the annual Hall Of Fame Game. To make matters worse, in 1935, an old baseball was discovered in an attic in Fly Creek, New York, among some of Abner Graves' possessions. Everyone in Cooperstown assumed for some reason that this old, torn up, beat up ball had belonged to Abner Doubleday. Stephen Clark, a local business man, bought the baseball for five dollars and displayed it in the Village Club in Cooperstown. People from surrounding counties soon were coming to see the Doubleday Baseball. His display grew and evolved into what is now the Baseball Hall Of Fame. 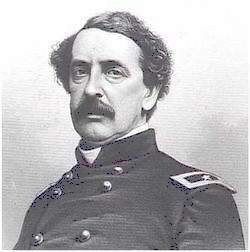 Abner Doubleday was a military man who had a distinguished career as a soldier from 1842 to 1873. But from what we now know, most likely had nothing, or at least very little, to do with the invention of baseball. But the legend continues. Ask anyone you know who invented baseball. Ask someone who doesn't even know much about the game. I'll bet they say that Abner Doubleday invented baseball. Finally in 1939, Alexander Cartwright was inducted into Baseball's Hall Of Fame as the originator of baseball. But the myth about Abner Doubleday still exists. As I was researching this article, I looked for the year that Abner Doubleday was inducted into the Hall Of Fame. I couldn't find it. Then I discovered that it's because he was never inducted! You would think that if Doubleday really invented baseball, that his plaque would be hanging there. Maybe Cooperstown should change the name of their ballpark to Cartwright Field. Just a thought.